No sooner had I been reveling in the cool chill of January (if that’s really what you can call the “none-heat” that we enjoy during the Christmas and New Year holidays) than February came in, putting an end to my blissful respite from the heat. Make no mistake, February is not summer…oh no. Summer will start its engines next month and grow steadily stronger and more merciless in April and May. What this is, well, I don’t really know what this is, save for the fact that the temperature is rising and unfailingly turning even the simplest tasks into ordeals of sweaty effort. And I’ve just started my journey to a planet almost completely covered in sand with hardly any water…perfect timing right? I can simultaneously be literally, and literarily, engulfed in hot climate! Thankfully, water here is not as costly as it is over there (although we do still have to buy it! If you are Finnish, my envy for the water that comes out from your taps for FREE knows no bounds). So I can enjoy my books with an icy glass of water and be grateful that it is a luxury I can well afford. Along with gorgeous produce…and the wonderful salads that they can become when I am just too seeped-dry to attempt anything else. Although I am not one to stop cooking my much loved stews and braises “just because it’s hot out” (otherwise I would hardly ever have then), I am not immune to how crippling our heat can become. Many days, especially ones like these when the sun seems to come out with both guns blazing, I am more inclined to put together a salad. – Steam the talbos ng kamote (leaves and soft stems only) for 3 minutes. Immediately plunge into a bowl of ice water then set aside to drain in a colander. – Top the drained leaves with the tomato, shallots, ginger, bagoong, vinegar, and pepper. Toss lightly to just combine. Taste and adjust seasoning (you can add more bagoong or vinegar if you’d like it more salty or sour). – Serves 2 as a side dish. This is a very simple salad widely made in lots of Filipino homes throughout the country. Talbos ng kamote or kamote tops are the leaves of our native sweet potato plant. You can use them in soups or stews (like munggo guisado), but I love them this way. Steamed lightly and tossed with bagoong alamang (shrimp paste), young native sibuyas (like shallots), kamatis (native tomatoes, not the huge salad ones you get at the supermarket), ginger, and a little drizzling of vinegar, it is a delicious reminder of why I love my native Filipino salads – salty, sour, a little tang from the tomatoes (which never become as sweet as their Western cousins), and the assertive pungency of raw onions. The combination of the steamed greens and the other, uncooked, vegetables results in something that is both crisp and yielding, a quality that a lot of our local salads have – more of which I hope to share with you as this blinding heat continues to descend. This is heaven on a hot, not-yet-summer, day. It is excellent eaten alongside some fresh fish, which is just what we did. To my neighbors over here…stay cool folks! To those of you still in the midst of winter…please send some ice! this type of salad is very Bisaya. We call it gay/kamote in Cebu and its my favourite. your preparations as well, they are exactly the same how we did it back home. Hi Tangled Noodle! I think our local salads need more airtime 😉 They are so good! Hello Dutched Pinay! Nice to know that I’m doing it right 🙂 I love this salad! I love this salad! We have it at home almost every week…but without the bagoong, just calamansi and patis. Lovely picture! That looks FANTASTIC. I am so full, it is 1:30 in the morning, and YET, I am tempted to go to my kitchen and make that! Too bad there isn't a 24 hour gourmet store where I could get sweet potato leaves! Sounds so interesting…. I will DEFINITELY be whipping that up in the next week. Beautiful! That is such a lovely idea for a salad! Looks fantastic! This is one of my favorite warm-weather salads because it's so refreshing yet so substantial at the same time. But haven't you noticed that the weather here in Manila's suddenly gone chilly again? Very colourful and packed with healthy veg! Hi Chef D! Must try it with patis soon! Hi Gabbyology! Hope you like it! Hi Midge! Yesterday evening was cooler…I’ll have to see what today is like! I hope we still get another “cool front” before summer arrives! Hi Brittany! Yup! Minimal cooking too! did you know that if you put some calamansi juice in the water that you used to blanch the kamote leaves, it will turn a a nice pink? add some sugar or honey and you have a healthy juice. healthy because my dietitian friends say most of the leaves' nutrients are left in the water. so that's camote leaves, two ways! this salad brings back my childhood memory… one time my mom took me to a hill to pick sweet potato leaves… although they probably weren't the same type. I am so attracted to the simplicity and natural flavor of this salad so am begging to have a taste even here's winter! Love the look of this salad. I'm wondering if the leaves of the sweet potato plants in my country are safe to eat. This salad looks delectable! I love all the colors! Hi Millet! Thanks so much for the tip! I did notice that the water turned a pink-violet color and I was just thinking how I could use it because it looked to pretty to toss 🙂 That is a great idea! Hi Anh! We use shrimp paste (called bagoong over here) in so many dishes…I always have a jar on hand! This looks delicious! I think I can find sweet potato leaves in the chinese market. I'm so pleased to have come across your blog! This recipe looks so exciting – can't wait to try it. Hi Veron! Hope you find them! What a beautiful, healthy and delicious looking salad! I must try this one. Beautiful blog. I remember first being introduced to kamote leaves ("kamote tops") traveling in the Philippines. I love them, although they're a bit harder to find fresh and local-grown in California! Thanks for sharing. Hi Shyla! Hope you like it! i love this! 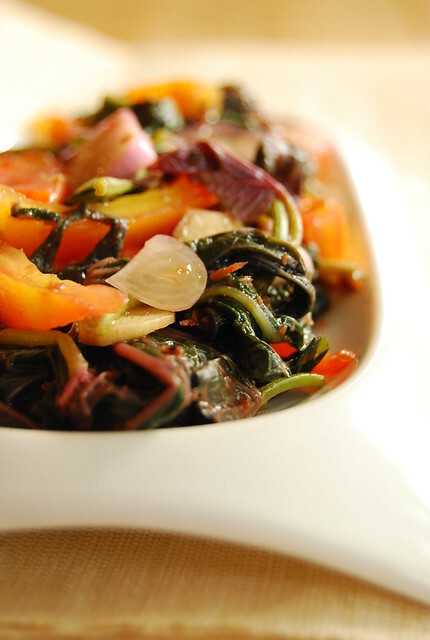 talbos ng kamote is one of my favorites–i have a small clearing in the garden dedicated to growing that and my other favorite gulay, alugbati. both are really easy to grow. Hi Nayna! Lucky you to have a garden…we live in a flat so no home-grown produce for us 🙁 Although I may try to grow something potted in my balcony! I remember when I was a kid, being the official picker of talbos ng kamote from our neighbor's vast vegetable patch when my mom needs some for doing this salad. This should be hard to find in the Philippines nowadays.